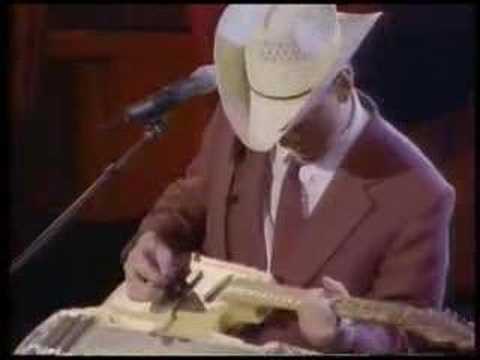 With his unique voice, more unique song writing, and even more unique double necked “Guit-Steel” guitar, there has absolutely never been ANYONE like Junior Brown. He’s an American Original. 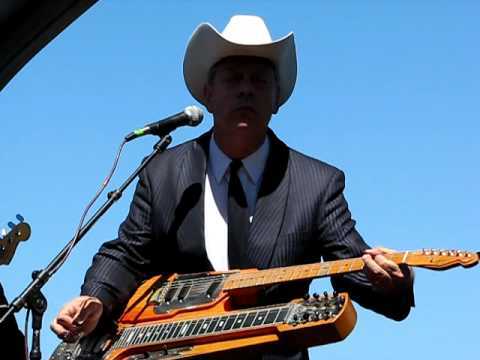 Born in 1952 in Cottonwood, Arizona, Junior Brown showed an affinity for music at an early age when the family moved to a rural area of Indiana near Kirksville. In the following years, Junior began to experience Country music and remembers it as “growing up out of the ground like the crops – it was everywhere; coming out of cars, houses, gas stations and stores like the soundtrack of a story, but Country music programs on TV hadn’t really come along much yet; not until the late fifties.” Discovering a guitar in his grandparent’s attic, he spent the next several years woodshedding with records and the radio. Junior was also able to tap into music he couldn’t hear at home which older, college aged kids were listening to. This was possible due to his father’s employment at small campuses throughout the next decade as the family moved twice again. As a young boy he was able to experience the thrill of performing before live audiences, at parties, school functions even singing and playing guitar for five thousand Boy Scouts at an Andrews Air Force Base jamboree; then while still a teenager, getting the chance to sit in with Rock and Roll pioneer, Bo Diddley. Armed with this broad spectrum of influences, he began to develop a storehouse of musical chops. Early on, Junior realized he had to keep his interest in Country music a secret; “it was like a secret friend I carried around, being careful not to tell anyone (especially girls) about my love for it because I thought they would laugh at me.” It wasn’t until the late 1960’s that Junior Brown would proudly explore the passion for the music he had loved since his early childhood in Indiana. With many prominent figures as his inspiration (Country legends, some who he would work with years later), he spent his nights in small clubs across the southwest. “I played more nights in honkytonks during the Seventies and Eighties than most musicians will see in a lifetime… I did so many years of that, night after night, four sets a night, fifteen minute breaks; I mean after that, you’ve gotta get good or you gotta get out. The early 1970’s California Country dance club scene was particularly competitive, but I learned professionalism and stage demeanor which has served me well to this day.” More recently however, Junior has shown himself to be equally adept at a wide variety of American music styles beyond Country. These include Rock and Roll, Blues, Hawaiian, Bluegrass and Western Swing. There is a dependable consistency in Junior’s writing style (he writes nearly all his material) yet he’s always full of pleasant surprises. Though Junior always knew he could sing and play what he wanted, he had yet to explore his potential as a songwriter. “I realized no one was going to walk into a club and discover me…so I started hanging out with some songwriters who I’d played some jobs with, and they showed me how to support myself by writing and publishing.” With his writing coming together by the mid-Eighties, Brown upgraded his gear in a way that no artist had ever done. Struggling through each show, going back and forth plugging and unplugging guitar to steel guitar while singing, he had a dream one night about the two instruments mysteriously melding into one. The result was Brown’s unique invention, the “Guit-Steel”, a double necked instrument combining standard guitar with steel guitar. Built by Michael Stevens of Stevens Electric Instruments, the Guit-Steel allows Junior to switch instruments quickly in mid song while singing. According to Brown, his guitar and steel guitar playing became more his own around this time, with less imitation of others and more his own original ideas and licks. This maturation coincided with the development of a completely “Junior Brown” style of songwriting which employs subtle dry wit to some songs – others can be more overtly humorous, or just plain dead serious; like his playing, there is a wide range of styles that when combined can only spell Junior Brown. In the early nineties Brown and his band (including wife Tanya Rae) relocated to Texas to the active Austin music scene and landed a weekly gig at the Continental club. Having worked as a sideman for many of the Austin-based acts over the years, Junior was already well familiar with the town. His unique and entertaining combination of singing, songwriting, instrumental and production skills led to a seven record deal with Curb Records that began with “Twelve Shades of Brown” in 1993. He later released two albums on the TelArc label. There were several Grammy nods, a CMA (Country Music Association) award for “My Wife Thinks You’re Dead”, movie and repeated TV appearances like Letterman, Conan, Saturday Night Live, Austin City Limits, SpongeBob, X Files, Dukes of Hazzard, Me Myself and Irene, Tresspass, Still Breathing, Blue Collar Comedy Tour 1 and 2, and more recently, Better Call Saul. And there were the Ad Campaigns; The Gap, Lee Jeans and Lipton Tea. As Junior became more well known, he began to collaborate on projects with some of his heroes. These include a duet with Ralph Stanley for which Junior received a Bluegrass Music Association Award (IBMA), a duet and video with Hank Thompson, as well as duets with video and record collaborations with the Beach Boys, George Jones, Leon McAuliffe, Ray Price, Leona Williams, Lynn Morris, Lloyd Green and Doc Watson. He even played guitar for Bob Wills’ Texas Playboys in a radio commercial. Junior is currently finishing up recording on his latest album, “Deep In The Heart Of Me”. Release date is slated for Spring 2017. Junior’s performance on the promotional song, “Better Call Saul” was recorded and released both as a video on AMC as well as a flexible 33 1/3rd vinyl record included in the show’s box set from Season One. Junior, Tanya Rae and the band continue to tear up the highways and no doubt will be appearing in concert near you one of these days. Seeing Junior live is a definite must, so GUIT WITH IT ’cause he’s AN AMERICAN ORIGINAL!